Calling all Superheroes! Have you been looking for an opportunity to show off your superpowers in the areas of Science, Technology, Engineering, Art or Math? Well, now is your chance. PTA is hosting a STEAM Night and we want to see what you've got! --For help on how to do a science project, click HERE. --For help on how to create a presentation board, click HERE. STEP 5 - Pick up your project. All projects not picked up by June 7 will be thrown away. ✓ All experiments using vertebrate animals or humans as subjects should cause no harm or undue stress to the subject. These projects should have written approval from the teacher and parent before beginning the experiment. ✓ No live vertebrate animals should be exhibited on the night of the event. Instead, models, stuffed animals or photographs should be used in their place. Exceptions may be granted only with special permission. ✓ No human body parts should be displayed. Exceptions such as teeth, hair, or nails require special permission. ✓ Students should avoid doing experiments involving bacterial cultures. ✓ No controlled substances should be exhibited. ✓ No open flames will be permitted. ✓ Students should always wear safety goggles for eye protection when working with chemicals, or hot liquids. Parent approval and supervision will be required for these projects. ✓ All projects using household electricity must conform to standard wiring practices and safety. ✓ Expensive or fragile items should not be displayed. Valuable items essential to the project should be simulated or photographed.PTA and Highland Ranch take no responsibility for the valuables. ✓ Collections such as rocks, shells, feather, etc. can be protected with a covering of plastic wrap. ✓ Items to be displayed in front of presentation boards should be adequately secured. ✓ Carefully pack all materials when transporting to and from the school. ✓ Every student must submit an entry form, even if working in pairs or small group. ✓ While parent and adult assistance is encouraged, students should do their own work, including data collection, analysis, and reporting. For younger students, dictation of the project components is appropriate. Each student should be able to explain what they did, how they did it, and what they learned from the experience. PTA has a challenge for you. Are you up for it? It's called the Rainbow Challenge. Did you know that food is your best medicine? Eating the right foods will keep you healthy (they have special healing superpowers) and eating the wrong foods can make you sick (those darn villains)? 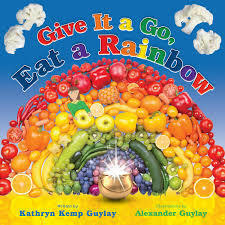 Eat as many colors of the rainbow each day and keep track on this form HERE. Challenge runs from May 1 to May 14. Turn in forms from May 14 to May 17. If you'd like to learn more, click HERE.